The Children of the Eucharist programme helps the children to develop a personal relationship with Jesus in the Eucharist. Their faith helps them to believe that Jesus is really present. He loves them so much and He is their best friend. This conviction will hopefully flow into the children’s family homes. – Sr. Briedge I.B.V.M. – Loreto Convent Dalkey, Co. Dublin. The children, all from Second Class, are developing a relationship with Jesus, their Best Friend. 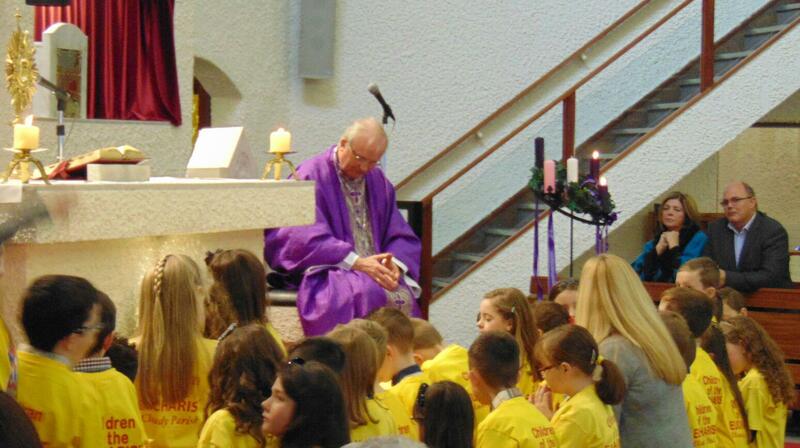 We have a Special Room in the School where we hold the monthly Adoration for the children. They come in to the room one Class at a time. They look forward to their Visit. They love to kneel, bow down and adore Jesus. During Adoration they feel safe and happy, listened to and loved by Jesus. At the end of Adoration, they are looking forward to coming back again to visit Jesus their Best Friend. This was all made possible for us by COTE and the training we got from Antoinette. So, thank you so much and I hope many other children in other schools will introduce COTE to their schools.